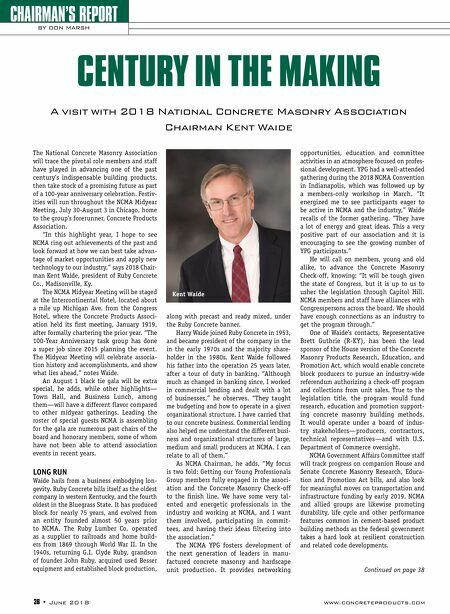 www.concreteproducts.com June 2018 • 37 CHAIRMAN'S REPORT KENT WAIDE, NCMA The National Concrete Masonry Association was founded in 1918 as the Concrete Products Association, based in Chicago and operating in the then-new Portland Cement Association (1916) Cement Products Bureau. Anchoring NCMA 100-year anniversary observances ahead of the August 1, 2018 gala—to be staged blocks from the site of the charter Concrete Products Association meeting—is the www.ncma100.site, loaded with concrete masonry technical and marketing content from 1918 forward. Among many highlights is a gallery compiled from "The Evolution of Concrete Masonry Machinery" chapter of FROM THE CARRIAGE AGE TO THE SPACE AGE: The Birth and Growth of the Concrete Masonry Industry. TOOLS OF THE TRADE HAND TAMP ERA: 1904-1914 Harmon Palmer is credited with a machine offering a welcome alternative to crude, purely manual blockmaking processes, including those using wooden forms and emu- lating adobe building tactics. His invention was soon copied by serious and shady proprietors alike, their machines yielding a range of sub-par to wall-worthy product. 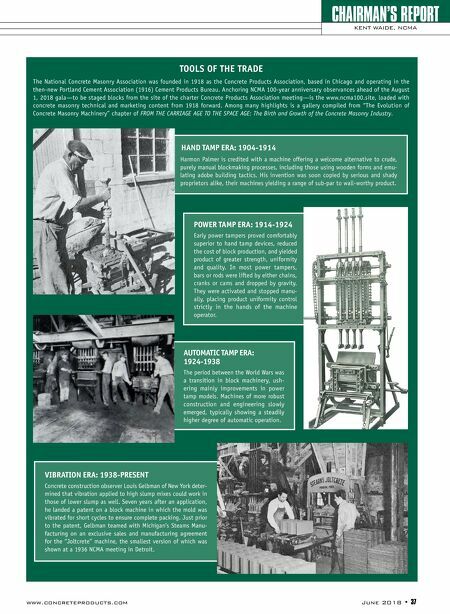 POWER TAMP ERA: 1914-1924 Early power tampers proved comfortably superior to hand tamp devices, reduced the cost of block production, and yielded product of greater strength, uniformity and quality. In most power tampers, bars or rods were lifted by either chains, cranks or cams and dropped by gravity. They were activated and stopped manu- ally, placing product uniformity control strictly in the hands of the machine operator. AUTOMATIC TAMP ERA: 1924-1938 The period between the World Wars was a transition in block machinery, ush- ering mainly improvements in power tamp models. Machines of more robust construction and engineering slowly emerged, typically showing a steadily higher degree of automatic operation. VIBRATION ERA: 1938-PRESENT Concrete construction observer Louis Gelbman of New York deter- mined that vibration applied to high slump mixes could work in those of lower slump as well. Seven years after an application, he landed a patent on a block machine in which the mold was vibrated for short cycles to ensure complete packing. Just prior to the patent, Gelbman teamed with Michigan's Steams Manu- facturing on an exclusive sales and manufacturing agreement for the "Joltcrete" machine, the smallest version of which was shown at a 1936 NCMA meeting in Detroit.